Inventory management functions are available within a few mouse clicks so you can create new inventory parts and manage inventory counts within seconds. The inventory reporting feature is also easy to get to and use. Select filters and data columns to render reports, export them to desired file types, then save your report settings for later use. 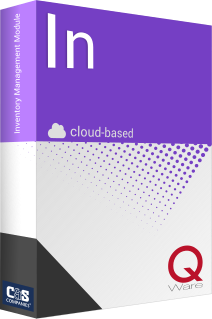 Adding inventory management software to your Q Ware suite will help maintain lean inventory levels, identify waste, and control costs. Turn-key setup means all of your parts and initial counts will be loaded into the program before first use. Reorder alerts make sure you'll never run out of parts or hardware when you need them. Why is Q Ware spares management software right for you? 3rd It's customizable - Inventory forms and categories can be customized. Inventory can be grouped together in "kits"
Units of issue can be customized.